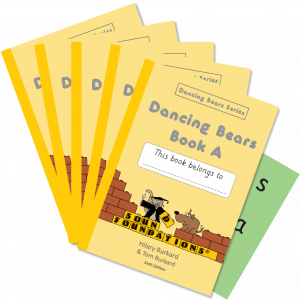 Look inside Dancing Bears Book A. The book starts with Decoding Power Pages consisting of carefully-structured word lists of simple three-letter words, such as hot and can. Common, unambiguous digraphs (e.g., ee, ar, sh) are introduced very quickly to prevent children becoming fixated on one-letter-one-sound. Less predictable spelling patterns and common irregular words (I, you, he, me, we, be) are introduced at a controlled rate in simple sentences with plenty of multi-sensory practice, and then with our Cloze Sentences once the pupil has developed good basic decoding skills. The Cloze Sentences are designed to be amusing and instructive, later on they play a big role in teaching vocabulary. Timed readings are used to develop fluency. Final and initial consonant blends are introduced in the second half of the book. 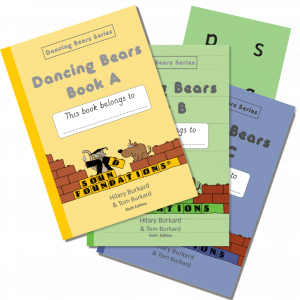 A selection of ‘Bear Markets’—micro-dramas for two or three voices—that were so popular when we first introduced them Bear Necessities are included in the latest edition of Dancing Bears A. There are two serial stories to maintain interest, each episode gives more sustained practise of a new spelling pattern. 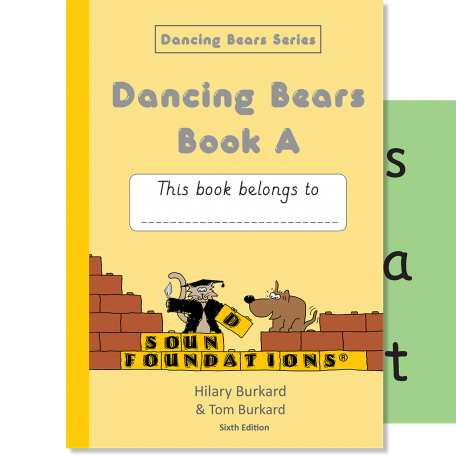 Meanwhile, advanced flashcards, with less common digraphs and spelling patterns, are introduced to prepare the pupil for Dancing Bears Book B. By using a cursor, children are taught to scan from left to right—this eliminates the need for coloured overlays or tinted lenses. Old material is constantly reviewed, so nothing is ever forgotten.